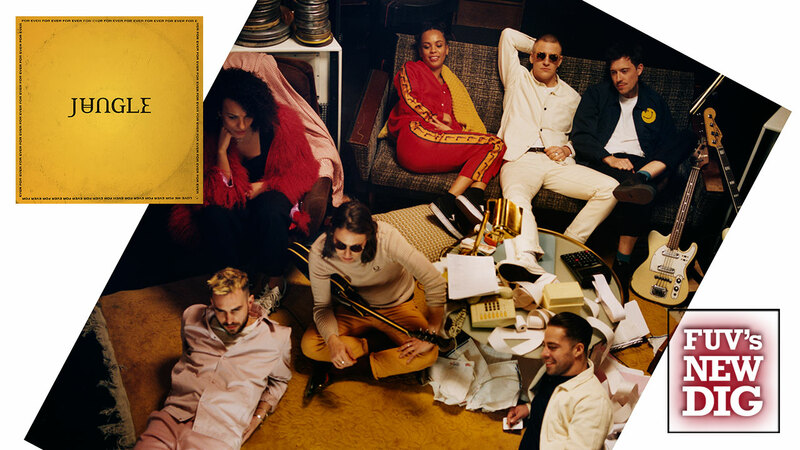 Jungle, the British soul, funk, and dance ensemble, is back with their second collection of groove-laden, rhythm-drenched tunes. They call their sophomore album For Ever and it’s a polished jewel of dance floor euphoria, with an undercurrent of emotional turmoil hidden between and beneath the beats. At the heart of Jungle are Tom McFarland and Josh Lloyd-Watson, two London-based musicians who have known each other since they were boys. Five years ago, they formed Jungle. Their mission was to marry their music with visual elements, forging an image that could represent the band and still allow the duo to create behind a cloak of anonymity. McFarland and Lloyd-Watson also operate Jungle as a collective, rather than a traditional band with a static lineup. That mutability allows Jungle to have a musical fluidity and versatility. Their self-titled debut album was released in 2014 and was shortlisted for a Mercury Prize that same year. Jungle also paid a visit to Studio A for an FUV Live session. Jungle's second album is even better than their critically praised debut. Woven throughout For Ever's sleek, synthesized disco beats, sampled grooves, and falsetto vocals are reflections that traverse the world of style and glamor, but ultimately are obsessed with the dark side that lurks beneath the elegant chic. Broken relationships, shattered dreams, obsessions, and pleas for reconciliation darken many of the grooves that are laid down. With For Ever, Jungle offers a celebratory glance at a glossy slice of life, but at the same time McFarland and Lloyd-Watson never hesitate to address the emotional turmoil and pitfalls inevitable in that glitzy world.